What exactly is Segway Polo? Segway polo is similar to horseback polo, but adapted to Segways. Opposing teams play on a rectangular field to hit a ball into their opponent’s goal. Teams of 3 to 6 Segway-bound players each (varies per league and for private events), compete to win the majority of 3 15-minute matches. In playoffs and finals, ties will continue to sudden-death overtime. Gameplay rules are similar to soccer and involve free hits for minor offenses, goal kicks for major offenses, warnings and penalties, etc. Check out the League Rules for the nitty gritty. Anyone with an inkling for an awesome time! Also, you must be 19 or older, over 100 lbs, and under 250 lbs. You may sign up as a group or as a free agent. In our leagues, teams will have a maximum of 5 or 6 players each. Additionally, you should be in fair health to play, not have any significant recent injuries, have decent balance and hand-eye coordination, and not potentially be pregnant. If you would like to inquire about your particular health situation, please email us at info@segwaypolo.wtf. The $100 (early-bird) or $125 per person registration fee includes use of all game supplies including the Segway i2 unit for 5 weeks of gameplay. It also covers insurance, facilities, referees, etc. Oh yeah, and a team t-shirt! Upcoming game time details are to be announced. Games are played indoors at SportsHouse in Redwood City on AstroTurf field #2 and at High 5 Sports in San Francisco in the Richmond District. The location of league play in Oakland is still to be finalized. What are the safety concerns and precautions associated with Segway Polo? Predominantly, Segway-to-Segway accidents which are minimized with Gameplay Rules designed to discourage them. Accidents may result in warnings, which may result in a reduction in the operator's Segway's maximum speed or even ejection from the game. Generally, as experience grows the number of accidents decreases. Helmets are required during gameplay. Other safety equipment including elbow, wrist, and knee pads are also provided as seen fit or necessary. What distinguishes your Segway Polo league from others I can find online? We’ve redesigned our Segway Polo from the ground up to be a safer and more fun and engaging game. A larger game ball eliminates Segways from driving up onto it, and minimizes falls from doing so. The ball is also lighter, which allows it to be lifted from the field floor for a more 3-dimensional game. Our mallets are actually Wiffle ball bats which don’t get jammed in Segway wheel wells and hurt much less when they rarely, yet undoubtedly, hit other players. Finally, our rules are designed to maximize safety and fun, in that order. 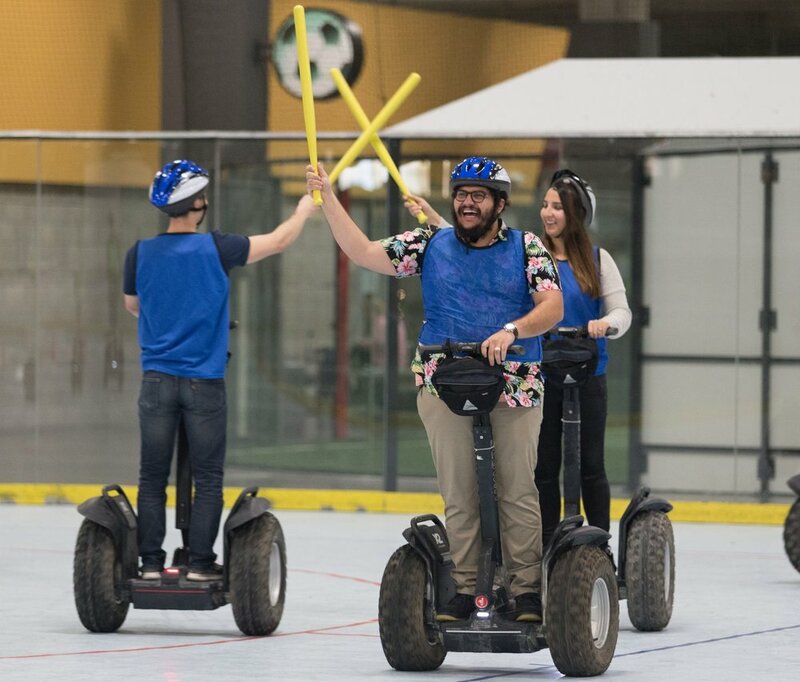 Tyler’s Mystery Tours began playing Segway Polo as an offering for team-building events and private parties. As a result, we’ve discovered how ridiculously fun it is, how gameplay just doesn’t get old, and we’ve gathered a following of players who want league play. Our winter Redwood City league is just the beginning with planned expansions to San Francisco City and Oakland. If you’d like to keep up to date, subscribe to our newsletter below to receive pertinent announcements. Your message has been received, We'll get back to you shortly!